The Enferplex™ Camelid TB assay is a qualitative luminescent (emission) immunological method for the detection of in camelid serum or plasma. The Enferplex™ Camelid TB kit is intended for in vitro veterinary diagnostic use and research purposes only. Tuberculosis is a chronic, contagious, granulomatous disease caused by mycobacterial species belonging to the mycobacterium tuberculosis complex, (1). 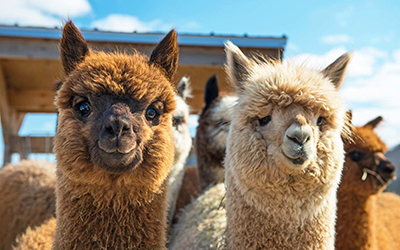 Camelids were generally not considered highly susceptible to tuberculosis (TB), (2), but in recent years serious concern has arisen about TB in New World Camelids (NWC) particularly Llamas and Alpacas in some countries where they are reared not just their native South America. Tuberculosis also affects old world camelids including dromedaries and Bactrian Camels. Mycobacteria are generally not species-specific pathogens (1). Inter-species transmission may therefore occur and there are many potential sources of infection for camelids. M. bovis strains isolated from NWCs are often the same molecular types that are isolated from tuberculous cattle and badgers in the same geographical area, suggesting spill over of infection from non-camelid reservoirs (3). The clinical signs in Camelids include wasting, anorexia, and respiratory distress, enlargement of the superficial lymph nodes, recumbency and eventually death (4). Clinical signs are often associated with extensive respiratory pathology, and it is surprising that overt respiratory distress is sometimes not observed in animals with serve lung lesions (5). Animals are occasionally found dead with no previous clinical observations. The test is currently available through Sure Farm Ltd. in the UK and is being used as part of the Camelid Voluntary Health Scheme for Bovine Tuberculosis in conjunction with Sure Farm. For further information please contact Sure Farm Ltd. Further information can be read here in a Farmers Weekly article and also as published in Veterinary Record. For further information please contact Sure Farm Ltd.
3) Connolly D.J., Dwyer P.J., Fagan J., Hayes M., Ryan E.G., Costello E., Kilroy A., & More S.J., (2008). Tuberculosis in alpaca (Lama pacos) on a farm in Ireland. 2. Results of an epidemiological investigation. Irish vet. J., 61 (8), 533-537. 4) Abdurahman O.S., & Bornstein S. (1991). Diseases of camels (Camelus dromedarius) in Somalia and prospects for better health. Nomadic Peoples, 29, 104-112. 5) Barlow A.M., Mitchell K.A., & Vusram K.H. (1999). Bovine tuberculosis in Llama (Llama glama) in the UK. Vet Rec., 145 (22), 639-640.